The Labradoodle is a cross between the Labrador Retriever and Standard or Miniature Poodle. It was first bred in Australia in 1989 by breeder Wally Conron, who sought to create a dog with the Labrador’s characteristic obedience and versatility and the Poodle’s hypoallergenic coat. As a crossbreed, the Labradoodle is not eligible for registration with purebred registries such as the American Kennel Club, but it can be registered with the American Canine Hybrid Club. 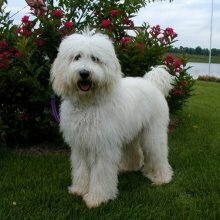 Some breeders produce Labradoodles by crossing a purebred Poodle with a purebred Labrador Retriever (called a first generation cross), but others allow crossing Labradoodles with Poodles or Labrador Retrievers (called a backcross), or other Labradoodles (called a multi-generation cross). Different crosses can result in different characteristics. Australian Labradoodles are considered a purebred by some as they have been bred for sufficient generations with sufficient stock (some also contain Cocker Spaniel or Irish Water Spaniel ancestry) to produce a suitably consistent offspring (called ‘breeding true’). Like other ‘designer breeds’, the Labradoodle has seen a recent surge in popularity. These lovable dogs have become popular with many individuals, celebrity and everyman alike. Labradoodles have found their way into the homes of Tiger Woods, Jennifer Aniston, and Barbara Eden, star of I Dream of Jeannie, whose Labradoodle ‘Djinn Djinn’ was named after her invisible dog on the show. Other trends demonstrating the popularity of the Labradoodle are the inclusion of the word ‘Labradoodle’ in the Oxford English Dictionary, a Labradoodle figurine in the ‘Here and Now’ edition of Monopoly, and the award winning ‘Lucky the Incredible Wonder Pup’ Labradoodle animated toy. The Labradoodle has an average shoulder height of 13-26 in (33-66 cm) and weighs 22-88 lbs (10-40 kg). Labradoodles resulting from crosses with Toy Poodles are smaller than those resulting from crosses with Miniature or Standard Poodles. As a crossbreed, the Labradoodle may have a wide variety of features, but typical features are those listed in the Australian Labradoodle standard: a broad head with medium stop (depression where the muzzle meets the forehead), wide set eyes, flat ears level with the eyes, scissors bit, large nose, low set tail, and body slightly longer than tall. Due to the Poodle influence, the Labradoodle may have a wide variety of coats. The Labradoodle coat may be wiry or soft, straight or curly, or anywhere in between. There are a wide variety of possible Labradoodle colors, including white, cream, red, brown, black, and gold. First generation crosses shed lightly with a wispy hair coat, Second generation Labradoodles of primarily Poodle mixture are nonshedding with a fleece textured coat or hair coat, and higher generation Labradoodles are nonshedding with a fleece textured coat. The Australian variety is non-shedding with a fleece or wool textured coat. The Labradoodle is friendly, family oriented, and lively. It is very clever, perky, and funny. Labradoodles love their family and are highly loyal. The Labradoodle will try to get away with mischief if its owner doesn’t keep it in line. The Labradoodle is friendly, family oriented, and lively. It is very clever, perky, and funny. Labradoodles love their family and are highly loyal. The Labradoodle will try to get away with mischief if its owner doesn’t keep it in line. Labradoodles are friendly with dogs, other pets and children. They are affectionate with strangers and do not make good watchdogs. You can find Labradoodle puppies priced from $150 USD to $20000 USD with one of our credible breeders. Browse through our breeder's listings and find your perfect puppy at the perfect price. Labradoodles are friendly with dogs, other pets and children. They are affectionate with strangers and do not make good watchdogs. The Labradoodle requires monthly brushing to keep the coat free of tangles, more often for curly coats. The Labradoodle has a lifespan of 13-15 years. It is susceptible to hip and elbow dysplasia (malformed joints which can cause lameness or arthritis) and PRA, a retinal disorder, but as a mixed breed it is somewhat less likely to suffer health problems than purebreds (known as ‘hybrid vigor’). The Labradoodle is intelligent and eager to please, making it straightforward to train. Labradoodles are able to learn a wide variety of unusual tricks. Labradoodles may attempt to outsmart their owners when they see an opportunity. Labradoodles require a moderate amount of exercise such as a daily walk or playtime in a fenced-in yard. Most are fond of swimming, like their parent breeds. The Labradoodle is well suited to apartment life. Labradoodle Puppies for Sale - Shipped Worldwide! Finding the right Labradoodle puppy can be dog gone hard work. PuppyFind® provides a convenient and efficient means of selecting and purchasing the perfect Labradoodle puppy (or Labradoodle puppies) from the comfort of your home, 24 hours a day, 7 days a week. Take advantage of our PuppySearch or leisurely browse our directory of hundreds of dog breeds, Labradoodle dog breeders, Labradoodle dogs for adoption, and Labradoodle puppy for sale listings with photos and detailed descriptions. Some Labradoodle puppies for sale may be shipped Worldwide and include crate and veterinarian checkup. Many Labradoodle dog breeders with puppies for sale also offer a health guarantee. With thousands of Labradoodle puppies for sale and hundreds of Labradoodle dog breeders, you're sure to find the perfect Labradoodle puppy.